Thinking of Barcelona, the first thing that will strike the mind is the city's mesmerising architecture, murals, statues and graffiti. Barcelona's architectural treasures span 2000-plus years. Towering temple columns, ancient city walls and subterranean stone corridors provide a window into Roman-era Barcino. Fast forward a thousand years to the Middle Ages by taking a stroll through the shadowy lanes of the Gothic quarter, past tranquil plazas and soaring 14th-century cathedrals. In other parts of town bloom the sculptural masterpieces of Modernism, a mix of ingenious and whimsical creations by Antoni Gaudi and his Catalan architectural contemporaries. 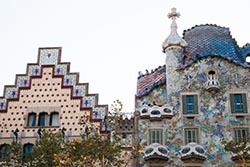 Barcelona has also long inspired artists, including Salvador Dali, Pablo Picasso and Joan Miro, whose works are in bold display in the city's myriad museums. Barcelona was our last destination of our 2-week Portugal & Spain holidays. We took a Renfe (fast train) from Madrid and were at Barcelona train station in just about 3 hours and 30 minutes. We would be in Barcelona for 3 nights; of which the first 2 nights we were booked at Hotel Silken Gran Havana and the last night at Tryp Airport Hotel – just to make it convenient for us to catch our early morning flight home. The evening of our arrival was spent walking the Passeig de Gracia; shopping at Zara (what else in Spain? ), resting at Placa Catalunya and strolling La Rambla. 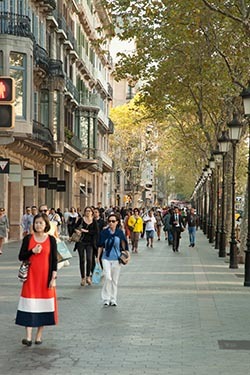 Passeig de Gracia is one of the major avenues in the city and one of its most important shopping and business areas, containing several of the city's most celebrated pieces of architecture. 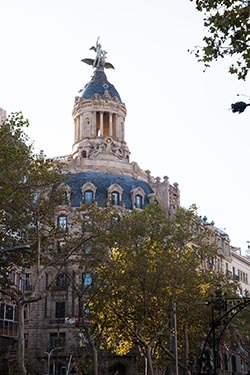 It is located in the central part of Eixample stretching from Placa Catalunya to Carrer Gran de Gracia. The avenue is regarded as the most expensive street in Barcelona and in Spain. Formerly known as Cami de Jesus, the Passeig de Gracia was originally little more than a quasi-rural lane surrounded by gardens joining Barcelona and Gracia, which was then still a separate town. This was still the case at the time of the first urbanisation project in 1821, which was devised by the liberal city council, and led by Ramon Plana. This project had to be cancelled due to the epidemics that were raging in Barcelona at the time. After the demise of the liberal government with the return of Absolutism in 1824, the project was taken up again by general Jose Bernaldo de Quiros, marquis of Campo Sagrado. The new avenue was 42 metres wide in 1827 and became a favourite place for aristocrats to display their horse riding skills and expensive horse-drawn carriages all through the 19th century. 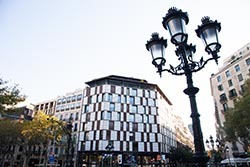 In 1906 the architect Pere Falques i Urpí designed the avenue's now famous ornate benches and street-lights. By that time it had become Barcelona's most fashionable street, with buildings designed by Art Nouveau architects of fame such as Antoni Gaudi, Pere Falques, Josep Puig i Cadafalch, Lluis Domenech i Montaner, Enric Sagnier and Josep Vilaseca. On this avenue is Casa Batllo and Casa Mila or La Pedrera. One of Gaudi's largest and most striking works is the Casa Batllo (1904–1906). 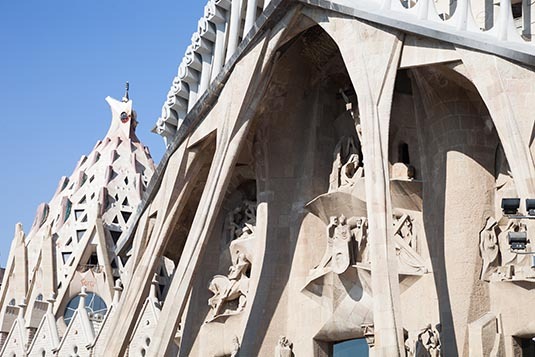 Commissioned by Josep Batllo i Casanovas to renovate an existing building erected in 1875 by Emili Sala Cortes, Gaudi focused on the facade, the main floor, the patio and the roof, and built a fifth floor for the staff. The facade is of Montjuic sandstone cut to create warped ruled surfaces; the columns are bone-shaped with vegetable decoration. Gaudi kept the rectangular shape of the old building's balconies — with iron railings in the shape of masks—giving the rest of the facade an ascending undulating form. He also faced the facade with ceramic fragments of various colours, which Gaudi obtained from the waste material of the Pelegri glass works. The interior courtyard is roofed by a skylight supported by an iron structure in the shape of a double T, which rests on a series of catenary aches. The helicoidal chimneys are a notable feature of the roof, topped with conical caps, covered in clear glass in the centre and ceramics at the top, and surmounted by clear glass balls filled with sand of different colours. The facade culminates in catenary vaults covered with two layers of brick and faced with glazed ceramic tiles in the form of scales (in shades of yellow, green and blue), which resemble a dragon's back; on the left side is a cylindrical turret with anagrams of Jesus, Mary and Joseph, and with Gaudi's four-armed cross. Another of Gaudi's major projects and one of his most admired works is the Casa Mila, better known as La Pedrera (1906–1910), commissioned by Pere Mila i Camps. Gaudi designed the house around two large, curved courtyards, with a structure of stone, brick and cast-iron columns and steel beams. The facade is built of limestone from Vilafranca del Penedes, apart from the upper level, which is covered in white tiles, evoking a snowy mountain. It has a total of five floors, plus a loft made entirely of catenary arches, as well as two large interior courtyards, one circular and one oval. Notable features are the staircases to the roof, topped with the four-armed cross, and the chimneys, covered in ceramics and with shapes that suggest mediaeval helmets. 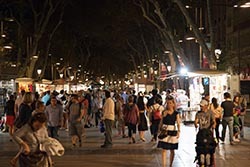 The tree-lined central promenade of La Rambla is crowded during the day and until late in the night. Its origins as a watercourse are reflected in the paving design, which appears to ripple like water. Along the promenade's length are kiosks that sell newspapers and souvenirs, other kiosks selling flowers, street traders, performers, and pavement cafes and bars. 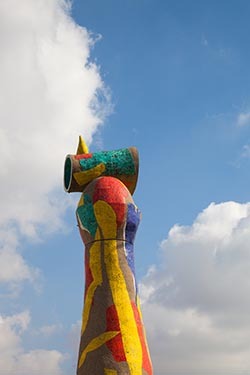 Several notable sights are also located within the promenade, including a mosaic by Joan Miro, and the Font de Canaletes, a famous fountain and popular meeting point. Strolling along the Rambla, one can see such historic buildings as the Palace of the Virreina and the famous Liceu Theatre, in which operas and ballets are staged. The La Boqueria market opens off the Rambla and is one of the city's foremost tourist landmarks, housing a very diverse selection of goods. One of the side streets, only a few metres long, leads to the Royal Square, a plaza with palm trees and porticoed buildings containing many pubs and restaurants, and in which stamp and coin collectors gather on the weekends. Before walking back to our hotel that was located on Gran Via de les Corts Catalanes, we had dinner in one of the by lanes of Rambla. The next day we would explore the town using the Barcelona Hop-On-Hop-Off Bus Turistic. The bus has two routes Red and Blue. A good point to hop-on would be at Placa Catalunya. We first boarded the Red line and got down at MNAC (National Museum) on Montjuic Hill. Montjuic Hill has borne witness to, and been the focus of key events that have shaped its personality. The first such event was the 1929 International Exhibition held in Barcelona which fostered the development of the zone. More recently, the 1992 Olympic Games brought about major renewal. 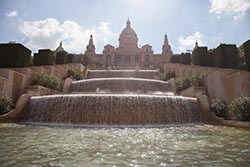 Montjuic is also home to museums, such as the Fundacio Miro, the Museu d'Arqueologia, the Museu Etnologic and the Museu Nacional d'Art de Catalunya-MNAC. The latter, which is housed in the Palau Nacional, the centrepiece of the 1929 exhibition, invites us to discover 1,000 years of Catalan art. The Pavello Mies van der Rohe, which was the German pavilion at the event, is a superb example of Bauhaus architecture. The former Casaramona textile factory, a modernista landmark by Puig i Cadafalch, is now home to Caixa Forum, a cultural centre which hosts temporary exhibitions. The Olympic Ring, the main site of the Olympic Games, features the stadium, the Estadi Lluis Companys, Arata Izosaki's sports palace, the Palau Sant Jordi, and the telecommunications tower designed by Santiago Calatrava. Nearby, the Museu Olimpic i de l'Esport Joan Antoni Samaranch and the Botanical Gardens are also unmissable sights at the Parc de Montjuic. Driving downhill, we crossed the Columbus Monument, Port Vell, Gothic Quarter, the Cathedral and back to Placa Catalunya. The Columbus Monument is a 60 metre tall monument to Christopher Columbus at the lower end of La Rambla. It was constructed for the Exposicion Universal de Barcelona (1888) in honor to Columbus' first voyage to the Americas. The monument serves as a reminder that Christopher Columbus reported to Queen Isabella I and King Ferdinand V in Barcelona after his first trip to the new continent. At the Placa Catalunya we hopped on to the Blue Line. 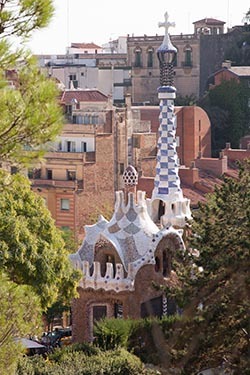 Two major attractions on this route were Sagrada Familia and Park Guell. La Sagrada Familia inspires awe by its sheer verticality, and in the manner of the medieval cathedrals it emulates, it’s still under construction after more than 100 years. When completed, the highest tower will be more than half as high again as those that stand today. The Temple Expiatori de la Sagrada Familia (Expiatory Temple of the Holy Family) was Antoni Gaudi’s all-consuming obsession. Given the commission by a conservative society that wished to build a temple as atonement for the city’s sins of modernity, Gaudi saw its completion as his holy mission. As funds dried up, he contributed his own, and in the last years of his life he was never shy of pleading with anyone he thought a likely donor. Gaudi devised a temple 95m long and 60m wide, able to seat 13,000 people, with a central tower 170m high above the transept (representing Christ) and another 17 of 100m or more. The 12 along the three facades represent the Apostles, while the remaining five represent the Virgin Mary and the four evangelists. With his characteristic dislike for straight lines (there were none in nature, he said), Gaudi gave his towers swelling outlines inspired by the weird peaks of the holy mountain Montserrat outside Barcelona, and encrusted them with a tangle of sculpture that seems an outgrowth of the stone. At Gaudi’s death, only the crypt, the apse walls, one portal and one tower had been finished. Three more towers were added by 1930, completing the northeast (Nativity) facade. In 1936 anarchists burned and smashed the interior, including workshops, plans and models. Work began again in 1952, but controversy has always clouded progress. 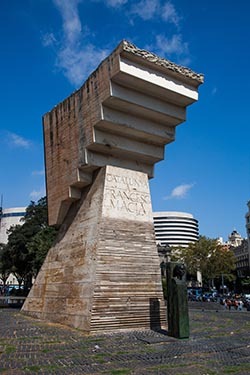 Opponents of the continuation of the project claim that the computer models based on what little of Gaudí’s plans survived the anarchists’ ire have led to the creation of a monster that has little to do with Gaudi’s plans and style. It is a debate that appears to have little hope of resolution. Like or hate what is being done, the fascination it awakens is undeniable. Guesses on when construction might be complete range from the 2020s to the 2040s. Even before reaching that point, some of the oldest parts of the church, especially the apse, have required restoration work. Park Güell is located in La Salut, a neighborhood in the Gracia district of Barcelona. With urbanization in mind, Eusebi Guell assigned the design of the park to Antoni Gaudi, a renowned architect and the face of Catalan modernism. The park was built between 1900 and 1914 and was officially opened as a public park in 1926. It’s quite an uphill walk from the bus stop. Be prepared for a good trek else take a cab or a local bus that drops at the Park Guell gates. Park Guell is the reflection of Gaudi’s artistic plenitude, which belongs to his naturalist phase (first decade of the 20th century). During this period, the architect perfected his personal style through inspiration from organic shapes. He put into practice a series of new structural solutions rooted in the analysis of geometry. To that, the Catalan artist adds creative liberty and an imaginative, ornamental creation. Starting from a sort of baroquism, his works acquire a structural richness of forms and volumes, free of the rational rigidity or any sort of classic premises. In the design of Park Guell, Gaudi unleashed all his architectonic genius and put to practice much of his innovative structural solutions that would become the symbol of his organic style and that would culminate in the creation of the Basilica and Sagrada Familia. Antoni Gaudi i Cornet was a Spanish Catalan architect from Reus and the best known practitioner of Catalan Modernism. 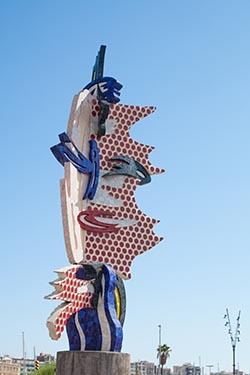 Gaudi's works reflect an individualized and distinctive style. 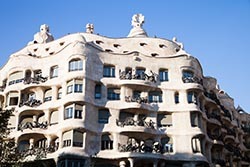 Most are located in Barcelona, including his magnum opus, the Sagrada Família. Gaudi's work was influenced by his passions in life: architecture, nature, and religion. Gaudi considered every detail of his creations and integrated into his architecture such crafts as ceramics, stained glass, wrought ironwork forging and carpentry. He also introduced new techniques in the treatment of materials, such as trencadis which used waste ceramic pieces. Under the influence of neo-Gothic art and Oriental techniques, Gaudi became part of the Modernista movement which was reaching its peak in the late 19th and early 20th centuries. His work transcended mainstream Modernisme, culminating in an organic style inspired by natural forms. Gaudi rarely drew detailed plans of his works, instead preferring to create them as three-dimensional scale models and molding the details as he conceived them. Gaudi's work enjoys global popularity and continuing admiration and study by architects. His masterpiece, the still-incomplete Sagrada Familia, is the most-visited monument in Spain. Between 1984 and 2005, seven of his works were declared World Heritage Sites by UNESCO. That evening, we were back at La Rambla for a hearty walk and tapas dinner that would be accompanied by red sangria. The next morning, we checked our bags out and spent time till late afternoon strolling and shopping. At 5 PM we left for the airport hotel. Early next morning we would leave for home.